Its dark, it’s raining and you’ve just left the office. You remove the cover from your bike ahead of the long journey home. In goes the ignition key and then as you turn it you hear the dreaded whirring, clicking sound of a near-dead battery. You take out your jump-leads but there’s no one around. Push starts, bump starts, downhill starts… you’ve tried them all before and they just don’t work. Modern bikes with fuel pumps and electronic ignition systems need more oomph to get them going. Out comes the battery and into your back pack and on goes the cover again until you return by taxi the next morning. Owning and using a charger can help you prevent these problems but do you know what’s available? Modern devices are not just for charging but incorporate management and care systems to prolong battery life and optimize performance. 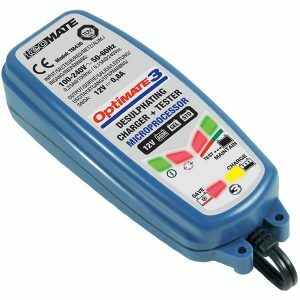 The TecMate OptiMate 3 Battery Optimiser is a high quality, high spec charger. The simple to fit fixed lead makes it extremely convenient to use. It will breathe life into any battery no matter how flat. Traditionally a rider would hook up a dead battery to a big lumpy charging device with a couple of small jump lead connectors and leave it running for a few hours. 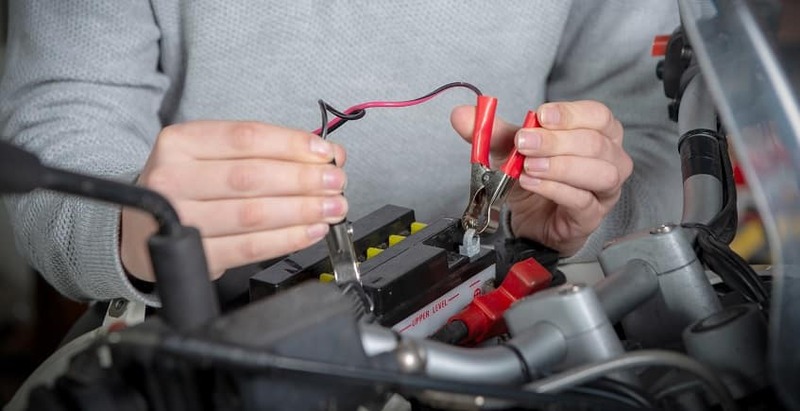 Now devices are small and allow permanently installed leads to run from the battery to a point on the bike where it’s easy to connect a power supply. Under the seat or somewhere relatively protected from dirt and rain is ideal. Some modern chargers are portable and can be transported and used in different locations. Dual battery chargers are also available and included in our list of reviews. It is important to check the manufacturer guidelines when making a purchase to ensure that the new charger is suitable for your bike’s battery. The charging device can be left on overnight, with near labour-free removal after use. Overcharging is avoided on modern units which monitor the levels of charging and adjust when full. This ‘charge and check’ management cycle can double the life of your battery. Some devices have a recovery mode for deeply discharged batteries by initiating a 20v charge with a low fixed current. This can cause any sulfur deposits to drop away from the terminal heads. Charging options are widened with modern optimisers many of which allow the installation of permanent cables onto which you can quickly insert a power chord. This avoids accessing the battery directly and playing around with crocodile clips and terminal screws. Units can now be wall-mounted or cable-tied to a beam in your garage. Some riders carry a portable, remote power pack in case they really do get caught short away from home. These can be connected to optimisers for a short charge and could make the difference in getting home or not. Depending on your bike’s luggage storage capacity you might even consider carrying a fully-charged spare battery as a backup although some may find this excessive. Damaged or poorly maintained batteries will struggle to hold their charge and may need replacing, however there are other sources that can drain them. Re-charging only goes so far when you have ‘parasitic loads’. Clocks, alarms and stereo devices have memories and each can consume up to .2 amps when left idle. Lengthy periods of inactivity such as over wintering your bike can also leave a battery flat. Motorcycle batteries do not behave quite like those of a mobile phone. With a smart charging and management device you can keep your battery permanently topped up without any resulting drop in charge holding ability. All things aside a well-maintained and properly charged motorcycle battery should give you 3 to 5 years of riding. The Belgian made TecMate charger comes with two connecting options; a straight traditional clip-on method with crocodile clips and leads and also the permanently installed lead for quick and easy charging access. The device emits a periodic de-sulfating pulse to remove any sulfur deposits around the terminals. It maintains a 100% charging level by connecting and disconnecting every hour. 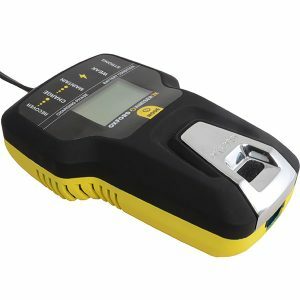 The Oxford Oximiser 900 Anniversary edition is a switch mode charger designed to automatically maintain, optimise and prolong the life of any 12 volt motorcycle battery. It works with all 12V battery types up to 20Ah including Gel, MF and conventional lead and refillable batteries. The management system provides real time information about the battery condition. Even ‘dead’ batteries as low as 4.1 V can be charged provided they’re not damaged. 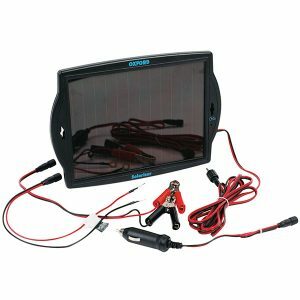 The British made Oxford Solariser Optimiser is designed for top-up charging in remote locations where there is no mains power source. Not made for charging dead or very low batteries its use is more to maintain charge and keep your battery operational on those long trips. Its trickle-charge current is between 10mA – 100mA. You don’t need very bright sunshine for it to work; the system charges even in normal daylight conditions. The Oximiser 3X is a slightly more chunky design than other charging models and comes with both the permanent cable and crocodile clip connectors. A soft start charging mode improves the recovery of deeply discharged batteries as low as just 8 volts. New voltage sensors quickly detect a high current drain and will automatically revert to the most appropriate charge rate. The twin battery optimizer diagnoses, recovers, charges and maintains two batteries simultaneously. It is ideal for owners of two motorcycles or those who just wish to charge a main and spare battery together. 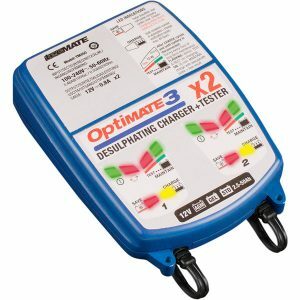 The OptiMate 3 x2 is suited to 12V starter batteries from 2.5 to 50 Amp-hours capacity and comes with permanent and crocodile clip connectors. Wall or ceiling mounting is also available. As the saying goes; prevention is better than cure, however with a modern charging optimizer you can have both. The old methods of charging the guts out of a battery until it expires have been replaced by sensible management and the avoidance of overcharging. As long as there are no parasitic loads or damage to your battery its life can now be extended way beyond what used to be considered normal.